Growing up, did your mother always tell you to stop slouching? Were your teachers constantly reminding students to sit up straight at their desk? While many people fail to realize it, your posture has a direct effect on your overall health and well-being. At F.I.R.S.T Health in Torrance, our certified and licensed chiropractors love educating our clients on the many benefits of good posture. 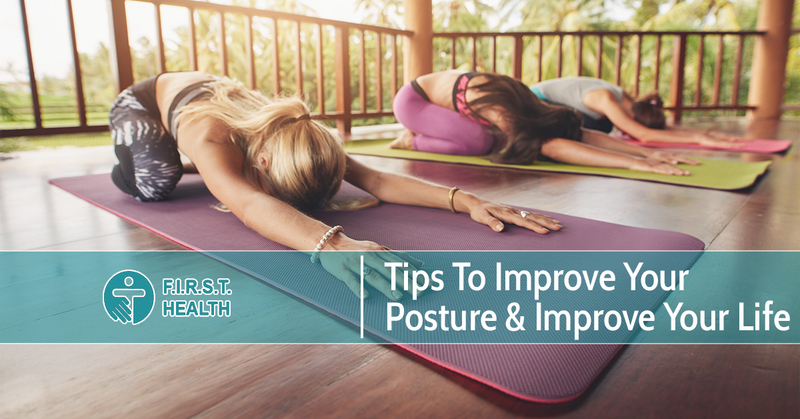 Whether you’re looking to uplift your mood or improve your muscle alignment, practicing good posture can do wonders for your mental and physical health. When you take steps towards improving your posture, you’ll not only look more confident — you’ll feel more confident! A study done at San Francisco State University revealed that improving your posture can affect your energy levels as well as the ability to generate positive and negative thoughts. In one experiment, test subjects were asked to either skip down the hallway or slouch as they walked down the hall. It was reported that almost all of the participants that skipped down the hall expressed feeling more energetic and happier, while those who walked down the hall with a slouch reported feeling sad, sleepy and lonely. At F.I.R.S.T Health, our licensed chiropractors understand the importance of proper bone and muscle alignment. When you practice maintaining good posture, you put significantly less stress on your spine and skeletal system. Since your skeletal system was specifically designed to support your body mass, proper spinal alignment can help keep your bones, muscles and ligaments strong and healthy. When you showcase poor posture, your muscles will start to overcompensate, putting stress on your body and causing muscle imbalances. When you make a point to sit and stand with good posture, you’re allowing your internal organs to rest in their natural position. This allows your gastrointestinal tract to naturally function and flow without any problems. New research suggests that poor posture is a contributing factor for a variety of digestive issues such as acid reflux, constipation and hernias. In order to improve digestion, it’s best to stand and sit up straight to ensure your organs have the room they need to work efficiently. A study at Ohio State University found that sitting up straight actually reinforced confidence among participants. In this particular study, researchers divided students into two groups and asked them to maintain opposite postures while answering a business questionnaire. Participants who were asked to sit up straight during the the questionnaire appeared to be significantly more confident in their thoughts and answers to questions. On the other hand, participants who were asked to slouch in their seat were less confident in their answers, suggesting their posture played a key role in their feelings of confidence. Do you struggle with headaches on a daily, weekly, or monthly basis? Improving your posture can have a positive effect on decreasing the frequency of your headaches. If you sit at a desk all day, you likely have what is known as “forward head posture.” This can put a significant amount of strain on your upper back and lower neck muscles, which can ultimately pinch nerves in your neck and lead you to having headaches more often. At F.I.R.S.T Health in Torrance, we’ve helped hundreds of people decrease and eliminate tension headaches caused by poor posture. If you’re concerned your headaches are a result of a pinched nerve or curved spine, contact our chiropractors today. We’ll take the time to thoroughly inspect your neck and spine and will recommend the best treatment solution for your condition and budget. F.I.R.S.T Health in Torrance is proud to be a leader of chiropractic treatment services in California. Whether you suffer from poor posture or lower back pain, our licensed chiropractors have the skills and experience needed to help you quickly regain mobility and flexibility in your spine and neck. With more than 35 years of experience in the industry, you can rest assured you’ll be in good hands. Contact our chiropractic facility today to schedule an appointment or request an appointment online! We are dedicated to educating healthcare practitioners about the indications for chiropractic care and how to optimally collaborate for the benefit of those we serve. Please plan approximately 60 minutes for your initial visit to the F.I.R.S.T. Health office. There are essentially 6 components to the visit. Our practice grows through the referrals of our satisfied patients, medical and complementary care colleagues. Contact us and get started today.